Glazed Over Beauty: e.l.f. Haul! Last week Eyes Lips Face, also known as e.l.f., had an awesome 50% off online sale. Initially, I just wanted to browse the website and see if there was anything intriguing. Remember how I said initially? There would be no point in this post if everything ended right then and there. Clearly I found some goodies, and I just had to share with you! 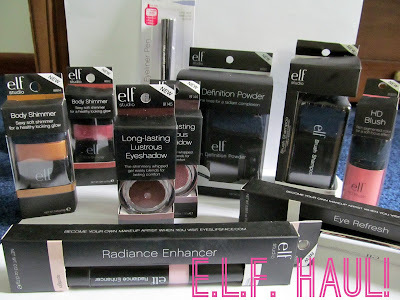 The awesome thing about e.l.f. is the products are dirt cheap, but you get so much value! All in all I spent just $24.45 - quite a steal! If you're looking to find some e.l.f. products of your own, you can typically find them at Target. 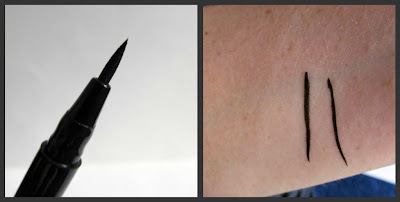 Waterproof Eyeliner Pen in Black - I love eyeliner pens, so I figured I'd give this a shot considering it was only $1. Much to my surprise, this eyeliner pen blew me away. It's really dark and vibrant and super easy to use. At the store, this is $2, and you just can't beat the price for the high quality product you get. Long-Lasting Lustrous Eyeshadow in Soiree and Gala - These eyeshadows are creme based and have a very light whipped texture. I wouldn't use these as a base by any means, but as the packaging suggests, these are perfect for highlighting the eyes or adding extra shine. Soiree is a gorgeous glittering mauvey pink, and Gala is a sparkling deep brown. Eye Refresh - I'm not entirely sure if this does anything, but I was enticed and couldn't pass it up. I've used it a couple times, and the metal rollerball feels nice and cool on the eyes but I haven't noticed any brightening effects as the packaging suggests it will provide. HD Blush in Headliner - Regardless of the fact that I always gravitate towards powder blush, I always find myself buying cream blushes! 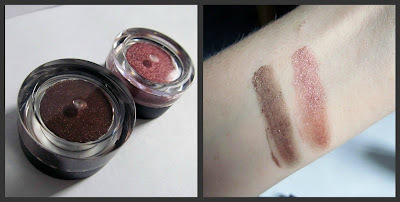 The swatches I've seen of these are gorgeous, so I wanted to try one out. The color pay off is really something, but I haven't tested it out to see how long it lasts. I also really love the packaging of these blushes - the pump applicator is fab. High Definition Powder in Translucent - Long have I lusted over this powder since Meg (ciaobellaxo on YouTube) said she uses it. This powder costs $6 at Target, and I was feeling stingy... but for $3 during this 50% off sale, count me in. I've heard it can cause a white-cast in picture taken with flash, which is definitely something to be careful of. 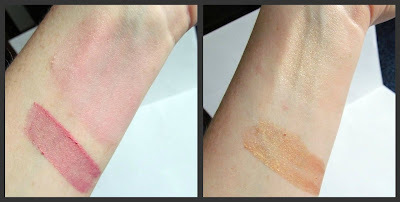 Radiance Enhancer in Spotlight - Hello, my name is Brianna and I'm a highlighter junkie. There I said it. Sadly, I swatched this on my hand and I don't know if I like it. It's very thick and creamy - it almost feels like a lotion, and it doesn't seem to give much "enhancement" in the light. I need to play around with this more to see if I like it. Brush Shampoo - Who doesn't need brush shampoo? (ME! - I have plenty) I'm a sucker for makeup brand brush cleaner? I don't know... don't judge me. Body Shimmer in Cosmic Coral and Golden Glow - Recently I've become obsessed with body shimmer, like this is 3rd grade all over again. I saw swatches of these and decided I needed not one, but two and I don't regret it for a second. 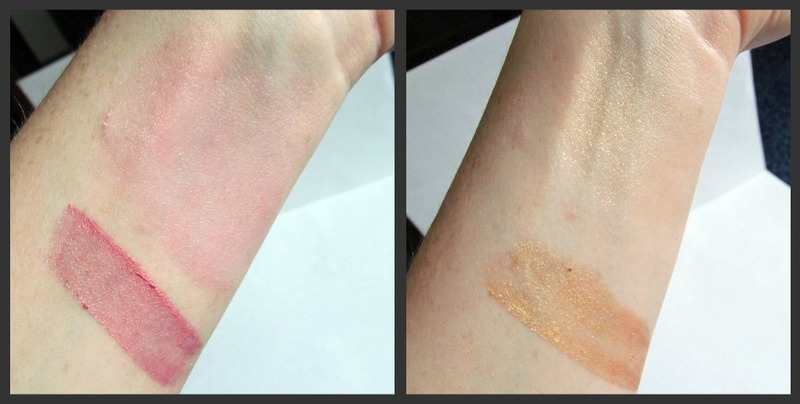 I think Cosmic Coral would work best as a cheek tint or highlighter, and Golden Glow is wonderful for a summer body shimmer.